Plastic Penny was a UK 1960s pop band, formed in November 1967 before splitting up in August 1968. The group had one hit single, early in 1968, with the song "Everything I Am". Most of the members went on to greater fame with other bands or in session work. Most of the material was psychedelic pop, with leanings towards a prog rock sound on some of the band's album tracks. The majority of the material was written by three of the band members, Brian Keith, Paul Raymond and Tony Murray. Keith later left the band leaving it a quartet and Raymond took over vocal duties. 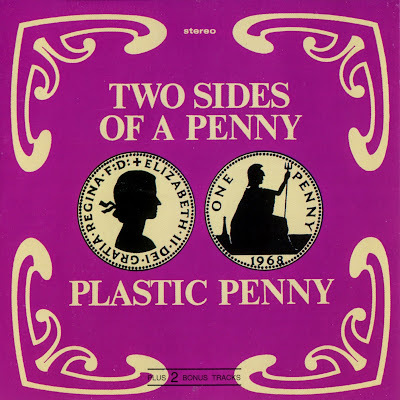 Plastic Penny's output was released on the Page One Records label. The band's swansong was appearing at the first Isle of Wight Festival, held on 31 August 1968. "Everything I Am" reached a high of number six in the UK Singles Chart. The song, enhanced with a string arrangement, was a slow ballad version of a song originally recorded by the Box Tops. It was written by Spooner Oldham and Dan Penn. Mick Grabham (then billed as Mick Graham) moved on to play with Cochise and then Procol Harum. Keith later became the lead vocalist with The Congregation, who share the "one-hit wonder" tag with Plastic Penny. Raymond replaced Christine Perfect in Chicken Shack and later played several spells with the long-lived rock band, UFO. Nigel Olsson became an in-demand session musician, most notably drumming on much of Elton John's early work and back with him from 2001. He also worked with the Spencer Davis Group, Uriah Heep, Kiki Dee, Neil Sedaka, Rod Stewart and Leo Sayer. The group's third and final album, Heads I Win, Tails You Lose was a collage of the band's more obscure recordings, issued after the group had disbanded.